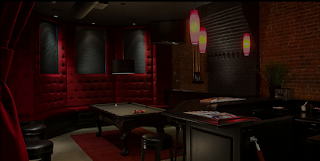 It's been quite some time since I've written about the Barbershop Lounge on Newbury Street. If you'll recall, last time it was to give away a $50 Gift Card to one lucky reader (here). The funniest part about that contest is that despite the Barbershop Lounge being geared towards men's grooming, most of the contest entrants were women ... women who had decided that their significant others needed a haircut. Anyway, I swung by there today to check the place out for myself. I've been growing my hair out for the last 3 months because I wanted to get it long enough to try out a new hairstyle. So this morning, with a photo of who I wanted to look like loaded onto my iphone (see pic to the left), I headed over to the Barbershop Lounge. The Lounge itself is very nice, it's got a modern feel (great fixtures) as well as plasma tv's and a pool table in the back while you wait. Let me take a step back and describe my usual hair cutting experiences which consist of SuperCuts or a random place in chinatown where they don't speak english. Yes the haircuts are cheaper there, but I always left the place mumbling under my breath "at least it'll grow back in a couple of weeks." My haircut this time around was awesome. Granted I still don't look like Andy Lau (see pic above) but at least I have his haircut. I definitely recommend you check this place out the next time you need some grooming done. And if you're getting a haircut, ask for Anna. She was great. Click (here) to checkout their website. 1 Response to "Review: The Barbershop Lounge is Awesome"
i can't tell you how much i love this post. if i could give you eprops or whatever, i would!